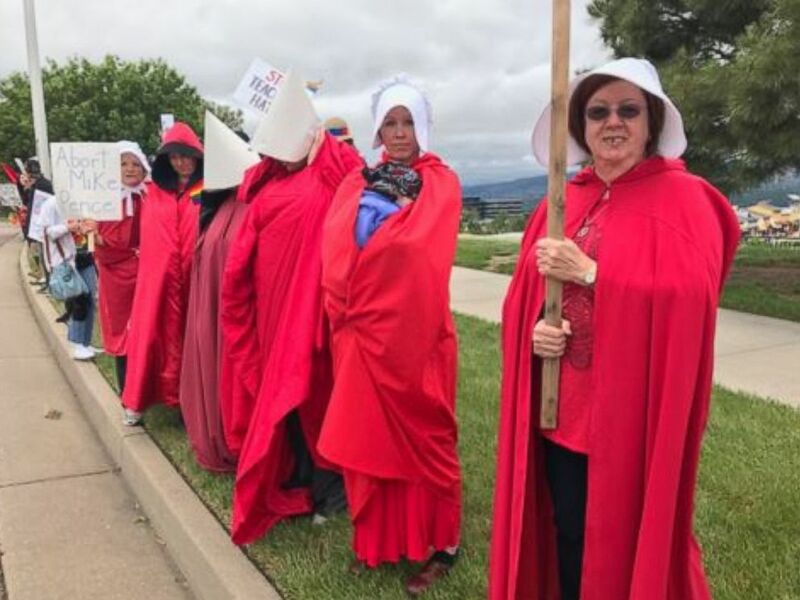 Protesters outfitted in red robes and white bonnets -- the signature look of "handmaids" in the Hulu series "The Handmaid's Tale" -- greeted Vice President Mike Pence Friday outside a speaking engagement in Colorado at the conservative Christian organization Focus on the Family. "The Handmaid's Tale" is set in a dystopian future, where fertile women are forced into sexual servitude and identifiable by their distinct wardrobe. The robe-wearing protesters -- who were part of a larger group of about 100, according to Colorado Springs ABC affiliate KRDO -- carried signs that read "Abort Mike Pence," "Stop Targeting Women's Healthcare" and "Stop Teaching Hate." Protesters outfitted in red robes and white bonnets -- the signature get-up worn by "handmaids" in "The Handmaid's Tale" -- greeted VP Mike Pence outside a speaking engagement in Colorado Springs, Colorado, on June 23, 2017, at Focus on the Family. "This organization believes being gay is a sin and that it's possible to convert people from being gay to straight -- it's ridiculous," robe-and-bonnet-wearing protester Nancy Stilwagen told KRDO of Focus on the Family. "So many people say we don't want Sharia Law in this country. People are pushing it. It's just not Islamic law. It's Christian law." 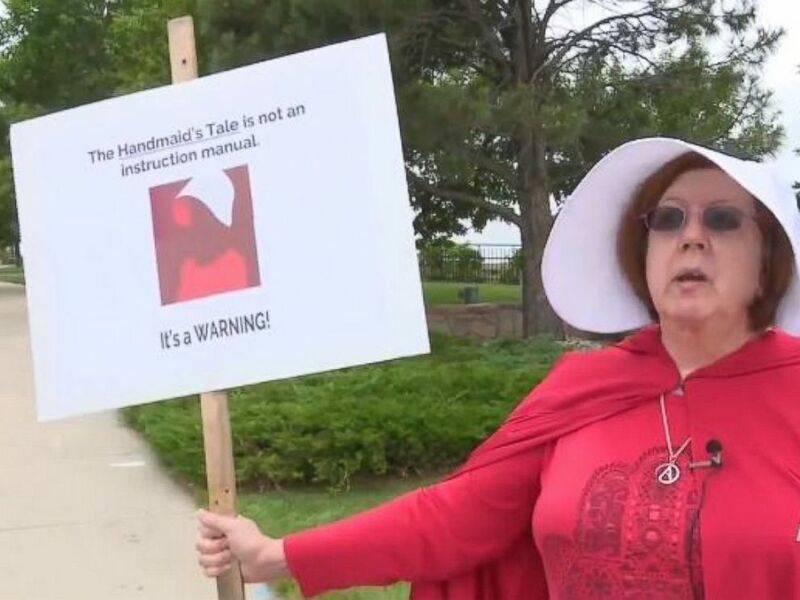 Stilwagen carried a sign that read, "The Handmaid's Tale is not an instruction manual. It's a WARNING." Pence told the audience of 1,650 that the organization should rekindle its interest in politics, especially in light of the Trump administration's proposal to slash funding to Planned Parenthood. "The time is now," Pence said, explaining that former President Barack Obama's health law is "dead." And then to a roar of applause and approval, he said, "This is when we are going to defund Planned Parenthood once and for all."